As mentioned, I want to discuss how Christians have misused and abused scripture, why this is wrong, and why we have done so in my next several posts. Usually I write what I have to say and then ask my readers questions but I would like to reverse that order for these posts. I would like to my readers to ponder several questions about the Bible. While I want everyone to feel free to leave any answers, comments or thoughts on this post, the purpose of these question are more to get people thinking about something they probably have not thought about. The Bible. What is the main message of the Bible? What exactly is the Gospel of Jesus Christ or the good news that is proclaimed in the New Testament? Why does the Old Testament matter to this message? How and why is the Bible authoritative? Is the Bible authoritative for non-Christians? How literal is the Bible to be understood? Feel free to provide your answers to these questions, or general questions, comments, or concerns about the Bible in the comments section below. If you ever had a question about the Bible that you were afraid to ask, this is a place to ask them. Feel free to use a false name if you need to. It might seem odd then that while I held such a lax attitude towards the Bible most of my life I earned my B.A. in Biblical Studies and to graduated with honors. Most of my friends in high school are shocked that I did not enter the military but instead went into ministry. This was a dramatic about-face. What the heck happened? The leap from not-really-caring-about-the-Bible-but- being-told-I-should to being trained in its original languages and studying it extensively was not just a conviction that fell out of the sky. In fact, it had to do with a very painful time in my life. I was a pall bearer at my Grandmother’s funeral. I, and her other seven male grandchildren, carried her lavender casket (lavender was her favorite color) towards her burial site a Lakewood memorial in Modesto, CA. My Grandmother passed from her second battle of melanoma (skin cancer) during my first real battle with depression. I had recently been informed that the Naval Academy had rejected me because of my arthritis without even looking at my application. This was a crucial aspect of my future plans that I had so far built my life about. I had lost all motivation to move forward in life, stopped attending school, quit several extracurricular programs, was raging at God for giving me arthritis which prevented me from doing what I wanted to in life and was contemplating suicide. When I heard my Grandmother had passed my initial reaction was, “Whatever God! I can take whatever you can throw at me!” The world truly did revolve around Kevin at that time and the death of my Grandmother was just an insult from God. However, carrying her lavender casket, it really sunk in that my Grandmother was dead. My Grandmother was the most peaceful and serene woman I have ever known. While I really only had very limited experiences of my Grandmother and was very young for most of them, almost all of these memories were positive and loving. I never heard her once raise her voice. This was in stark contrast to the instability and insanity that reigned in my home. This peace like a river was also something I was desperately craving in my time of turmoil. As the funeral continued I tried not to cry in order to support my mother who is an easy crier. This was odd considering that I hated my mother at the time, but it was deeply ingrained in me that I was responsible for managing my mother’s emotions, and this ingrained habit was deeper than my attitude towards my mother. I did very well until the pastor hit a certain point in his sermon. In my head I see now that I equated the peace and serenity my Grandmother had with the words in her Bible. The next day I went to a park near my house and let my Bible fall open and invited God, who I hated at the time, to show up. He brought me to Psalms 95 and I was convicted that God had not abandoned me but I had tested Him. In retrospect I see that I continued down a path God had clearly said “No,” a path I knew was not going to work out, and then blamed God when I ran into the inevitable. Several years of study, ministry and devotionals later and I came to a place where I had no idea what to make of the Bible anymore. The way I was trained and taught to use the Bible appeared to be highly problematic. The biggest problem was the biblical texts themselves. It seemed like their very nature and content defied how I was taught we should approach them. We were trying to force a round ball (the Bible) down a square peg (the way I was taught to understand and use it) and this was causing problems. I started to write the following posts to try and get some of my thoughts down on paper but then I ran into something. 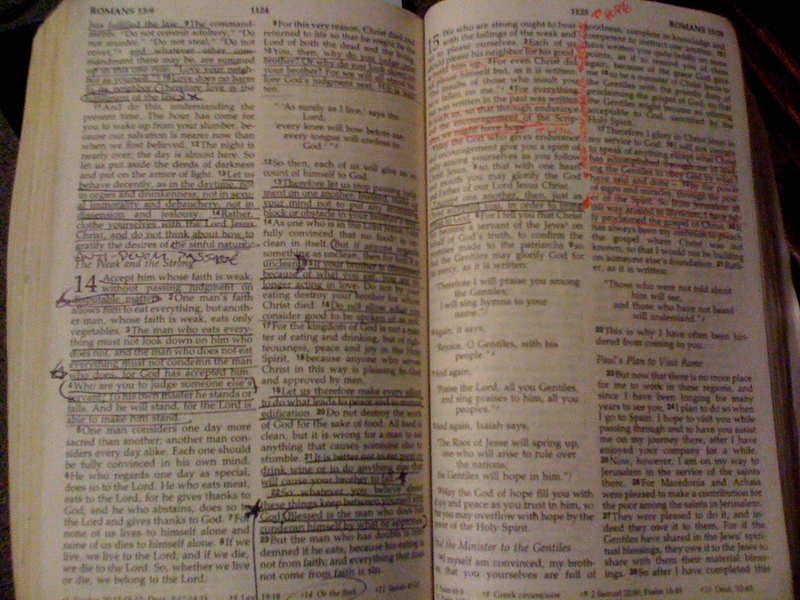 One day during this time I went to grab my Bible and noticed something. I was stunned by the fact that my Bibles do not look that different from my Grandmother’s. There are book marks, sermon notes, a card from “The Week” (a powerful time in my life), highlighter and pencil marks on every page. 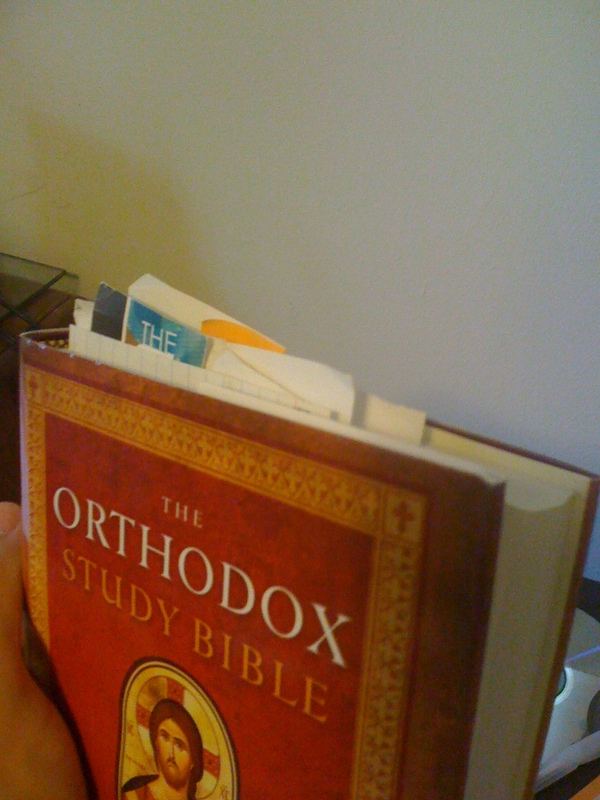 For better or for worse, since her funeral I have truly turned into a man well versed the Bible. However, while I searched the scriptures peace eluded me. It was only recently, when Jesus miraculously healed a lot of old emotional and spiritual wounds through prayer, that I have come to a place of peace. I say all this upfront so that people do not think I have a low view of scripture, scripture is unimportant to me or I that I write the following posts from a jaded or embittered place. It would be an error for anyone to dismiss what I have to say by suggesting that I don’t care about the Bible or respect how powerful God is and how God has used the Bible in the lives of His saints. I also want to point out the fact that I am not uneducated. While I know there are many people more educated in the Bible and theology than myself, I have studied the Bible more than most Christians I personally know. This year also marks my sixth year of formal theological education. I do not say this to boast about myself, but like Paul, want to point out the fact that I am a religious expert. My knowledge of the Bible does not make me a “good” or “better” follower of Jesus than others, but it would be an error for anyone to dismiss what I have to say by suggesting that I am uneducated or uninformed about the Bible. In the next several posts I am going to question the fundamental way most Christians I know, as well as many Christians in history, have approached the Bible. If my concerns are valid, this has profound implications for theology, and many people’s understanding of God, the world, sin, and what it means to be a follower of Jesus. This entry was posted in Faith, Personal Commentary and tagged Bible, Christianity, Jesus, the Bible, the word of God, Word of God. Bookmark the permalink. 2 Responses to How do you understand the Bible? The Bible is the fourth member of the Trinity. Anybody who disagrees with me is not following God Biblically.